Gov. 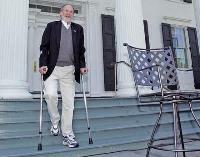 Jon S. Corzine returned to the state Legislature for the first time since an April car crash nearly killed him. Corzine broke his leg, 11 ribs, collarbone and sternum when his speeding sport utility vehicle, driven by a state trooper, slammed into a guard rail. The governor was hospitalized for 18 days, much of it in intensive care. "It's great to be back," Corzine said after pulling up in front of the Capitol in a special van he purchased to help him travel while he recovers. Corzine planned to meet with legislative leaders to discuss his proposed $33 billion (EUR24.59 billion) budget. He also may weigh nominations for two new state Supreme Court justices, including the chief. The governor, who resumed his duties May 7, has been working and rehabilitating from the governor's mansion in Princeton. Corzine was not wearing his seat belt in the crash. He voluntarily paid a $46 (EUR34) fine and apologized to the state. Last week, he released a public service announcement urging people to wear seat belts.